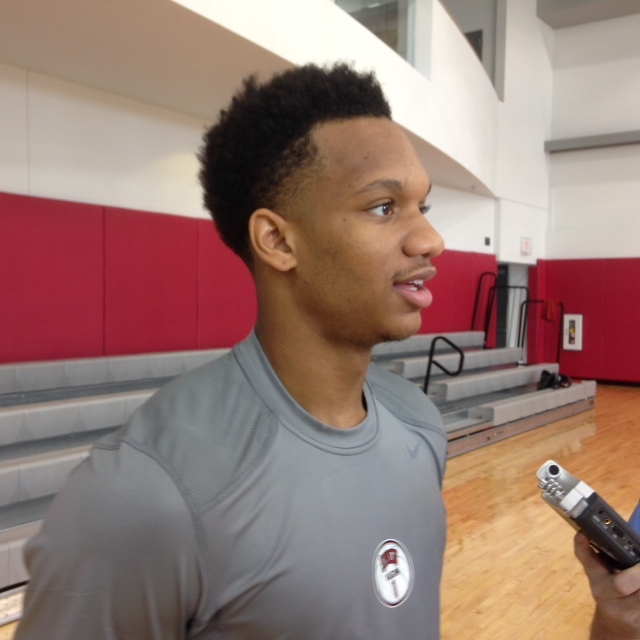 UNLV guard Rashad Vaughn was named the Mountain West Conference’s preseason Freshman of the Year and the Rebels were picked to finish fourth in the league’s annual preseason basketball media poll released Tuesday morning. The 6-foot-6 Vaughn was a McDonald’s All-American and rated as the No. 7 overall player in the country by Rivals his senior year at Findlay Prep (31-5) where he averaged 19.9 points, 4.5 rebounds, 4.9 assists and 2.2 steals per game as a senior, shooting 52 percent from the field, 43 percent from 3-point range and 77 percent from the free throw line. Defending Mountain West regular season champion San Diego State was the overwhelming favorite to win the men’s basketball regular season title again in 2014-15. The Aztecs received 34 of a possible 35 first place votes and 383 points to garner the top spot in the poll. Boise State claimed the remaining first place vote and 275 points to earn a second place nod, while defending MW tournament champion New Mexico garnered 270 points to finish third. UNLV collected 269 points for fourth place, followed by Colorado State in fifth (258 points) and Wyoming (256 points) in sixth. Rounding out the poll were Fresno State (232 points) in seventh place, Nevada (126 points) in eighth, Air Force (102 points) in ninth, Utah State (98 points) in 10th and San José State (41 points) in 11th. Wyoming senior forward Larry Nance Jr., coming back off an ACL injury, was voted preseason Player of the Year while 6-foot-9 San Diego State junior forward Angelo Choi, a transfer from Arizona, was named Newcomer of the Year. The UNLV Lady Rebels were picked sixth in the women’s preseason poll. Rk. Team (First-Place Votes) Pts.